Newcastle United players and staff were given the chance to sit out Sunday's relegation decider against West Ham. 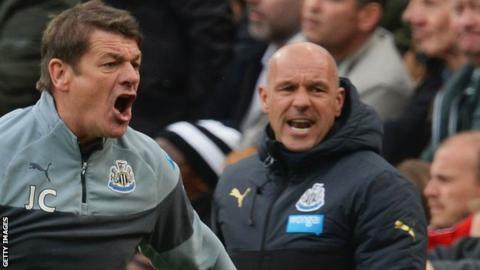 Assistant coach Steve Stone opened a door during a team meeting and boss John Carver told people to walk through if they "didn't fancy it". The Magpies are two points clear of Hull, who are in the final relegation spot and have a better goal difference. "I told them I was ready for a fight and a challenge," said Carver. "And not one person got up and left." Hull need to beat Manchester United in Sunday's final game of the season to have a chance of survival. Newcastle, who are looking for a first league win in 11 matches, need three points to guarantee their safety. Carver, 50, called together the players and senior staff after Saturday's 2-1 defeat by QPR. "I said straight out 'if anybody doesn't fancy it, if anybody wants to back-bite, if anybody wants to be negative - there's the door'," he said. "I don't think bringing in them just to tear a strip off them would have achieved anything. That's definite. I did that after the Leicester game, and you can't really say that it worked. "You have to try to find different ways of dealing with different situations." Asked about relegation, Carver said: "If it did happen, it would be unbearable and I don't know how long it would take to get over it." The Geordie - who described himself as "the best coach in the league" - has won just two games in 18 attempts. The club had two days of "frank dialogue" after Carver accused defender Mike Williamson of getting deliberately sent off during the 3-0 defeat against Leicester City. Newcastle fans are planning to stage a sit-in protest after the final whistle at St James' Park to call for owner Mike Ashley to sell the club. The 'Ashley Out' campaign blames the owner for plunging Newcastle into a third relegation fight in six years by not investing in the team despite making £19m profit.